A forthcoming issue of Journal of Family Communication will contain an article reporting a study of (a) family communication patterns, (b) participant political philosophy, and (c) evaluation of the credibility of the two major candidates in the 2012 U.S. presidential election. During the review process, a reviewer inquired how the political orientation of the mother/father might influence study results. This is a good question, but one that my data were not well-positioned to answer, as I did not collect data directly from the mother and father. I simply asked participants for their perception of their mother’s and father’s political beliefs, which obviously may be confounded with the participant’s own political beliefs (e.g., a highly liberal participant may see a moderate parent as more conservative than s/he actually is). Specifically, I analyzed two conditional process models (Hayes, 2013), whereby mother and father political philosophy moderated the associations in the model. To summarize, these models exhibited the following differences and similarities with the model reported in the main study: (a) Conversation orientation remained a positive predictor of both participant conservatism and Romney’s credibility; (b) Participant conservatism remained a positive predictor of Romney’s credibility and an inverse predictor of Obama’s credibility; (c) Conformity orientation ceased to be a positive predictor of participant conservatism, although it now inversely predicted Obama’s credibility (or, in the mother model, nearly so, p = .059); (d) Conversation and conformity no longer interacted to predict Obama’s credibility. 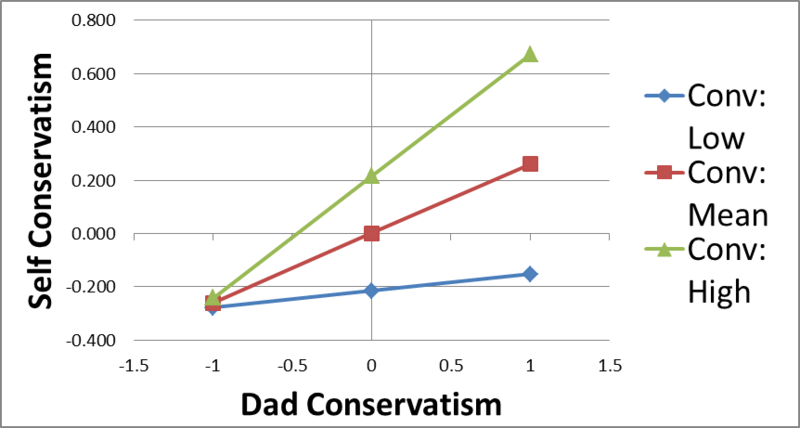 Almost no evidence emerged for moderated mediation, except for a significant interaction between father conservatism and conversation orientation on participant conservatism (p < .05). Decomposition revealed that the positive effect of conversation orientation was limited to conservative fathers. For liberal fathers, high conversation children tend to have a liberal political philosophy, yet their philosophy is just as liberal as if they had come from a low conversation orientation family. The main effects for parental political philosophy were limited to participant political philosophy and, with the exception of mother’s political philosophy as a predictor of Romney’s credibility, did not extend to candidate credibility. Taking this post hoc analysis overall, it is noteworthy that the associations for conversation orientation remained intact. Thus, incorporating parental political philosophy seems to most alter the effect of conformity orientation, which may be unsurprising given the historical and conceptual affinity between conservatism and conformity. Nevertheless, these results are reported here tentatively, as this study did not directly measure the parents’ political philosophy.